ANN ARBOR, Mich. -- University of Michigan head football coach Brady Hoke announced today (Tuesday, Aug. 27) that senior defensive back Courtney Avery (Mansfield, Ohio/Lexington), sophomore tight end Devin Funchess (Farmington Hills, Mich./Harrison) and fifth-year senior wide receiver Jeremy Gallon (Apopka, Fla./Apopka) will don Michigan Football Legends numbers this season. Avery, a team co-captain and three-year letterman, will wear No. 11 in honor of Francis, Albert and Alvin Wistert. The Wisterts, one of the great Michigan athletic families in school history, each wore the No. 11 jersey for the Michigan football program. All three brothers played tackle, were selected consensus All-Americans and were inducted into the College Football Hall of Fame and Michigan Hall of Honor. 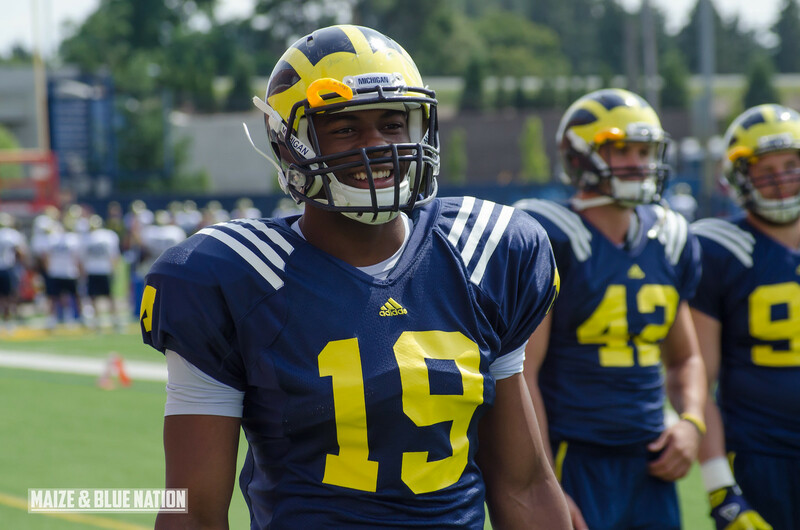 Funchess, who was named to the Football Writers Association of America Freshman All-America Team in 2012 after totaling 15 receptions for 234 yards and five touchdowns, will wear Ron Kramer's No. 87 jersey for the remainder of his career. Kramer was a two-time consensus All-American (1955-56) and a three-time All-Big Ten first-team selection (1954-56). He was a standout two-way player at offensive and defensive end, and also saw time at running back, quarterback, kicker and receiver. The former Green Bay Packers All-Pro tight end was a nine-time letterman in three sports at Michigan: football, basketball and track. Kramer led the Wolverines in scoring for two seasons on the gridiron while doing the same in basketball. Gallon, who has 84 career receptions for 1,331 yards and eight touchdowns, will don No. 21 in honor of 1991 Heisman Trophy winner Desmond Howard. Howard, an All-American and two-time All-Big Ten first-team choice, became the first Michigan Football Legend on Sept. 10, 2011. In addition to winning the Heisman, Howard was named the Maxwell Award winner, Athlon Sports Player of the Year and Walter Camp Player of the Year in 1991 after catching 62 passes for 985 yards and 19 touchdowns, while adding two touchdowns rushing and two touchdowns on returns. His 23 touchdowns in 1991 were the most ever in a single season in school history. Howard finished his three-year Michigan career with 2,146 receiving yards and 32 touchdown receptions. "The Legend jerseys aren't simply given, but earned," said Hoke. "Each of these three young men has done a great job of representing this program, and they understand the significance each of those numbers carries. I think they will do a great job of honoring those legacies." Senior/junior linebacker Jake Ryan (Westlake, Ohio/St. Ignatius) will remain in the No. 47 jersey this season in recognition of Bennie Oosterbaan, while Desmond Morgan (Holland, Mich./West Ottawa) will continue to wear No. 48 in honor of Gerald Ford. The famed No. 98 jersey of Michigan's first Heisman Trophy winner, Tom Harmon, will be recognized with Michigan Football Legend distinction on, prior to the Notre Dame game. It will be the final formerly-retired jersey number brought back into circulation.